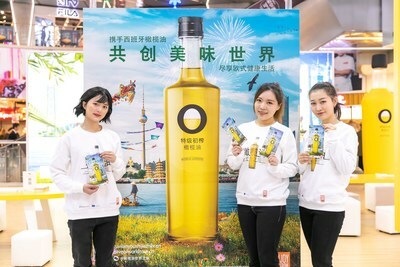 Olive Oils from Spain and the European Union continue with their promotional campaign the "Olive Oil World Tour" which presented in Beijing last September. This time they have chosen the cosmopolitan city of Shanghai to perform a special display at the SML Shopping Center B2 Courtyard, located in the Huangpu district of the city. Until the 9th December of this year, the public will be able to enjoy a spectacular space created by Olive Oils from Spain. This is a place where families can participate in a wide range of entertaining activities focussing on a millennial product of which the Mediterranean Diet is based, extremely popular among those who opt for a healthier diet. During this time, the public will be able to get to know the best extra virgin olive oils in the world and learn more about its uses. The public will also have the chance to participate in painting workshops, appreciate a selection of dozens of extra virgin olive oils, or participate through tablets in the digital contest via WeChat. The stand will also offer other conveniences for consumers: mobile charging points, wifi and a testing area for children to relax during their shopping day. This exhibit seeks to educate about the consumption of olive oils and teach the Chinese consumer about its benefits, its versatility in the kitchen and the wide range of aromas and flavors offered by a product that fits perfectly in the Chinese culinary tradition, benefitting from the healthy benefits of a food that triumphs all over the world. The organization has more than two years ahead to continue carrying its campaign "Let's Make a Tastier World" to Asian consumers and invite them to discover the benefits of Olive Oils, which are an emblem of European excellence. It will be implemented mainly at airports, train stations and shopping centers in the main cities of three continents: Asia, America and Europe. In Asia, it is estimated that more than 2,100 million impacts will be reached throughout the campaign.